Air seal and insulate metal ducts. Install the metal ducts. Use screws to secure connections. Wipe ducts to ensure they are clean and dry especially at seams and joints. Seal all seams and joints in the ducts with mastic. Cover all seams that are wider than 1/8 inch with fiberglass mesh tape then apply mastic. Install duct blanket insulation that is covered with a foil or plastic vapor barrier over the ducts. Overlap blanket by 2 inches and staple. Seal insulation blanket seams with mastic or UL-181 metal tape and mastic. Insulate all supply and return ducts located in unconditioned space. Meet code or program minimum R-value requirements. See the Compliance tab for R-value minimum requirements specified in the IRC, IECC, DOE Zero Energy Ready Home program, and ENERGY STAR criteria. pressure balancing (connections for jump ducts, dedicated returns). Ensure that insulation completely covers ducts and connections without gaps, voids, or compressions. Consider insulating all metal ductwork located in conditioned space, including supply and return ducts, duct boots, and exhaust ducts, to minimize condensation. See the Compliance Tab for related codes and standards, and criteria to meet national programs such as ENERGY STAR Certified Homes, DOE’s Zero Energy Ready Home program, and EPA’s Indoor airPLUS. Ideally ducts should be located in conditioned space, such as within a dropped ceiling, between floors, in an insulated basement or crawlspace, or in an unvented attic that is insulated along the roof line. If ducts are located in an unconditioned space, such as a vented attic or vented crawlspace, they should be sealed and insulated to prevent heat loss due to air leaks and conduction and to provide some protection against harsh conditions. Duct leakage is a double hit on the utility bill: 1) duct leaks are an uncontrolled loss of conditioned air to the outdoors and 2) duct leakage drives building infiltration. For example, if a home had a 2.5-ton (30,000 BTU/H) cooling system moving 1,000 CFM (cubic feet per minute) of air and the ducts had 10% leakage (which is typical in code-built homes), the leakage rate would be 100 CFM. Each cubic foot of air carries with it 30 BTUs/H, so 3,000 BTUs of conditioned air would be lost to the outdoors each hour. Duct leakage is an infiltration driver; it can negatively or positively pressurize the house depending on where the ducts are leaking, pulling outside air in through cracks in the building envelope or pushing conditioned air out. If the duct leakage is in the supply-side ducts, the house will be negatively pressurized compared to outdoors. If all the leakage is on the return side, the building will be positive with respect to outdoors. The field technician should understand this concept to help accurately diagnose the dominant sources of duct leakage. Whenever ductwork is located in unconditioned spaces, thermal insulation with a vapor barrier is a must to prevent unnecessary heat gain or loss through the duct walls and to prevent condensation from forming on the ducts themselves. For the insulation to work properly, it must be fully aligned and in contact with the walls of the duct system. A typical vented attic with a dark shingle roof can reach summer temperatures of 140ºF. At the same time, the dew point temperature in the attic will be about the same as it is outdoors. In humid climates "duct sweating" can become a significant problem if the ducts’ thermal and vapor barriers are not properly aligned along the entire length of the ducts. Metal ductwork is constructed using sheets of galvanized steel. Metal ducts are either rectangular or round in shape. Metal ducting consists of straight lengths, elbows, connectors, junction boxes, and register boots that are purchased or fabricated in the HVAC contractor’s shop and fitted together at the job site. A compact duct layout design with short, straight runs and minimal bends provides the best performance from an air flow standpoint and also reduces the number of lengths and seams that need to be sealed and insulated. For more on duct layout, see No Kinks or Sharp Bends in Flex Duct Installation. Duct installation standards and installation guidance are also provided in Manual D Residential Duct Systems 2009 Edition published by the Air Conditioning Contractors of America. Metal ducts for residential HVAC systems are typically insulated on the exterior using a "duct wrap," such as fiberglass blanket insulation with a foil-faced vapor barrier. Duct wrap comes in four-foot-wide rolls 50 to 100 feet long and in R-values that range from R-4 through R-8. Before applying duct wrap, sheet metal duct should be clean, dry, and tightly sealed at all joints and seams. The 2009 IECC (Section 403.2) requires that supply ducts located in unconditioned space be insulated to at least R-8 (return ducts can be insulated to R-6). For more on duct insulation levels, see Insulation Levels for Ducts in Unconditioned Space. Ducts should be sealed with duct mastic and/or metal tape that meets the requirements of the Underwriters Laboratory UL-181, UL-181A, or 181B (CEC 2005). Regular cloth-backed duct tape should not be used because it can dry out and fail quickly. Mastic is a thick, gooey, non-hardening substance that is spread onto the duct seams with a paintbrush or a putty knife. For additional strength with seams that are wider than 1/8 inch, cover the gap with fiberglass mesh tape then apply the mastic. 1. Install the metal ducts. Fit pieces together at joints by sliding the wider pipe over the narrower connecting collars. Use screws to secure connections. Wipe ducts with a dry cloth to ensure they are clean and dry especially at all joints and seams. 2. Use mastic to seal the seams along the lengths of the pipes, the seams in the elbows, the joints where the elbow and straight pieces are joined, where ducting is joined to the air handler, junctions between trunk ducts and branch ducts, and at duct boots. 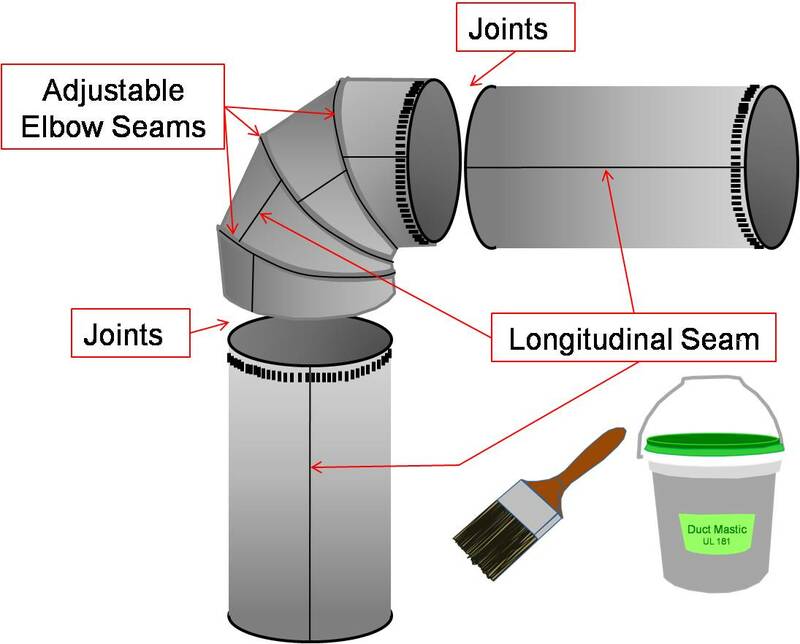 Figure 1 - Seal all joints and seams in the metal ductwork with mastic, including all joints and seams in elbows, before installing insulation. 3. Measure foil-faced blanket insulation to fit around the circumference of the pipe with two inches of overlap. Wrap the insulation around the duct with the facing to the outside so the 2-inch flap completely overlaps the facing and insulation at the other edge of the insulation. Insulation should be snugly butted but not wrapped too tightly, which would compress the insulation and reduce its R value. Follow the manufacturer’s "stretch-out" guidelines, which specify how much insulation to use, based on the pipe circumference, to ensure that the insulation thickness is maintained to achieve the rated R-value (see Table 1). The insulation should be a minimum of R-8 for all supply ducts and at least R-6 for all return ducts. Stretch-outs include 2 inches (51 mm) for overlap. 4. Overlap the insulation and staple along the seam every 6 inches at the "tape flap" using outward-clinching staples. 5. Wrap another piece of insulation around the next section of duct, overlapping two inches at the end of the first piece of insulation. Staple along the lengthwise seam and at the overlap. 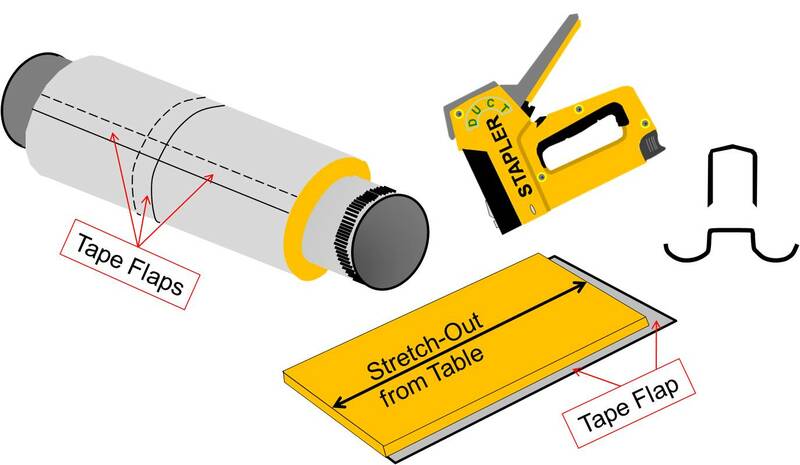 Continue overlapping and stapling until the entire length of duct is covered. After stapling, cover and seal all tape flaps and overlaps with UL-181 metal tape or mastic (mastic is recommended). 6. Make sure insulation covers all pipe connections to trunk duct, junction boxes, and boots. Figure 2 - When wrapping metal pipes with insulation, allow two inches of overlap and staple along the seam with outward clinching staples. Follow the insulation manufacturer’s guidelines for “stretch-out” to avoid pulling the insulation too tightly. After ducts are installed and before drywall is installed, the duct system should be visually inspected by a HERS rater to ensure that all connections are properly fastened and sealed, preferably with mastic. Locations to inspect include the main supply trunk to branch connections, at the duct boots, duct splices, the return box to the return ducts, jump duct connections, and exhaust fan and ERV/HRV connections. HVAC ducts should be tested for air leakage and proper air flow with a duct blaster test. This test should be done before drywalling when any air leaks can still be accessed and sealed. Ducts should be insulated along the length including at connections and the insulation should not be compressed by tight strapping, by framing members, or by excessive bending. The insulation should be a minimum of R-8 for all supply ducts and at least R-6 for all return ducts. 35. Item 6.3 does not apply to ducts that are a part of local mechanical exhaust and exhaust-only whole-house ventilation systems. EPA recommends, but does not require, that all metal ductwork not encompassed by Section 6 (e.g., exhaust ducts, duct boots, ducts in conditioned space) also be insulated and that insulation be sealed to duct boots to prevent condensation. ENERGY STAR Revision 08 requirements are required for homes permitted starting 07/01/2016. a. Up to 10’ of total duct length is permitted to be outside of the home’s thermal and air barrier boundary. i. In Moist climates (Zones 1A, 2A, 3A, 4A, 5A, 6A and 7A per 2012 IECC Figure R301.1) and Marine climates (all “C” Zones per 2012 IECC Figure R301.1), minimum R-8 duct insulation with an additional minimum 1.5” of closed-cell spray foam insulation encapsulating the ducts; duct leakage to outdoors ≤ 3 CFM25 per 100 ft2 of conditioned floor area (in addition to meeting total duct leakage requirements from Section 4.1 of the ENERGY STAR HVAC Rater checklist); and ductwork buried under at least 2” of blown-in insulation. ii. In Dry climates (all “B” Zones per 2012 IECC Figure R301.1), minimum R-8 duct insulation; duct leakage to outdoors ≤ 3 CFM25 per 100 ft2 of conditioned floor area (in addition to meeting total duct leakage requirements from Section 4.1 of the ENERGY STAR HVAC Rater checklist); and ductwork buried under at least 3.5” of blown-in insulation. Note that in either of these designs the HVAC equipment must still be located within the home’s thermal and air barrier boundary. d. Jump ducts which do not directly deliver conditioned air from the HVAC unit may be located in attics if all joints, including boot-to-drywall, are fully air sealed with mastic or foam, and the jump duct is fully buried under the attic insulation. e. Ducts are located within an unvented crawl space. f. Ducts are located in a basement which is within the home’s thermal boundary. g. Ductless HVAC system is used. Section 403.2.1 Insulation (Prescriptive). Supply ducts in attics are insulated to a minimum of R-8. All other ducts in unconditioned spaces or outside the building envelope are insulated to at least R-6. Section 403.2.2 Sealing (Mandatory). All joints and seams of air ducts, air handlers, filter boxes, and building cavities used as return ducts are substantially airtight by means of tapes, mastics, liquid sealants, gasketing or other approved closure systems. This section also specifies duct leakage testing. Section R403.2.1 Insulation (Prescriptive). Supply ducts in attics are insulated to a minimum of R-8. All other ducts in unconditioned spaces or outside the building envelope are insulated to at least R-6. Section R403.2.2 Sealing (Mandatory). All joints and seams of air ducts, air handlers, and filter boxes are substantially airtight by means of tapes, mastics, liquid sealants, gasketing or other approved closure systems. This section also specifies duct leakage testing. Section R403.3.1 Insulation (Prescriptive). Supply and return ducts in attics are insulated to a minimum of R-8 when the diameter of the duct is ≥ 3 inches and R-6 when the diameter of the duct is < 3 inches. Supply and return in ducts in other parts of the building must be insulated to a minimum of R-6 when the diameter of the duct is ≥ 3 inches and R-4.2 when the diameter of the duct is < 3 inches. This requirement doesn’t apply to ducts located completely inside the building’s thermal envelope. Section R403.3.2 Sealing (Mandatory). All ducts, air handlers, and filter boxes are air sealed and joints and seams must comply with the International Mechanical Code or International Residential Code where applicable. Exceptions: Additional joint sealing is not required when the ducts are covered with air-impermeable spray foam. Ducts that have a static pressure of < 2 inches, continuously welded joints and seams, and locking type joints that are not the snap-lock or button-lock type do not need additional closure systems. Section R403.3.3 and R403.3.4 specify duct leakage testing. Section R403.3.2 Sealing (Mandatory). All ducts, air handlers, and filter boxes are air sealed and joints and seams must comply with the International Mechanical Code or International Residential Code where applicable. Section M1601.3 describes duct insulation materials requirements including flame and smoke spread criteria and specifications for measuring and identifying insulation R values. Section M1601.4.1 Joints and seams. Tapes, mastics, and fasteners are rated UL 181A or UL 181B and are labeled according to the duct construction. Metal duct connections with equipment and/or fittings are mechanically fastened. Crimp joints for round metal ducts have a contact lap of at least 1 1/2 inches and are fastened with a minimum of three equally spaced sheet-metal screws. Exceptions: a) Joint and seams covered with spray polyurethane foam. b) Where a partially inaccessible duct connection exists, mechanical fasteners can be equally spaced on the exposed portion of the joint so as to prevent a hinge effect. c) continuously welded and locking-type longitudinal joints and seams on ducts operating at less than 2 in. w.g. (500 Pa). Section N1103.2 Ducts. Supply ducts in attics are insulated to a minimum of R-8, and all other ducts are insulated to a minimum of R-6, except those ducts in conditioned space. Air seal and test as described in Section N1103.2.2. Section N1103.3 Ducts are insulated and tested as specified in the IECC. Webpage with links to Document outlining the program requirements for ENERGY STAR Certified Homes, Version 3 and 3.1 (Rev. 08). Report descibing the sealing and insulating of HVAC duct systems in new and existing homes. Home Innovation Research Labs, a DOE Building America Research Team.